The original research came from Bunnyfoot’s work for a car insurance client who were investigating the effectiveness of Google Adwords. During the research, the team found that 81% of users clicked on PPC ads rather than organic results. Further investigation found that 41 of the 100 individuals tested did not know that Adwords were paid-for adverts, instead believing them to be the most authoritative links. Since that last research Google, as is its prerogative, has changed the way its presents ad listings, possibly as a result of EU anti-trust measures. This, in theory, should have made it easier for users to tell the difference between ads and organic results, though the issue is muddied by the fact that Google has removed the grey shading behind the ads. So how has this change affected users’ perception of search results pages? The user testing was carried out in multiple locations across London. 103 participants with a range of internet abilities were tested, all of whom used Google as their primary search engine. The participants covered a wide range of demographics and were aged between 18 – 65 years. 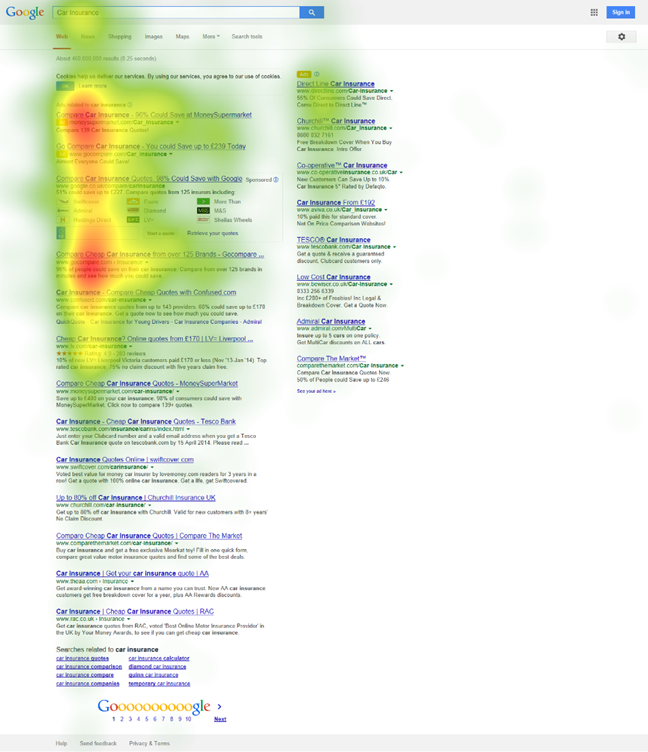 An eyetracker was used throughout the sessions in order to record where the participants were looking, and this generated aggregated heatmaps (Bunnyfoot looked at other factors of search result understanding and only report a subset here). All participants were then asked a series of post-test interview questions to gather further insight as to their understanding of Google’s results pages. When asked, 27% of users did not realise that Google had any advertising. Note for the stats gurus amongst you: we of course realise that we have used a relatively small sample size (albeit a large one for user testing and eyetracking studies) and whilst the figures above have considerable sampling error it does not detract from their impact and surprise. Have the changes to Google adwords made any difference? The research suggests that the changes have made little difference to users’ ability to distinguish between paid and organic results. Despite what I would assume was a clearer labelling of ads in the new formats, a significant portion of users still aren’t seeing the difference. If I was a Google sceptic, I would suggest that the big G itself may have carried out similar tests to find the format that would satisfy the EU, yet still attract the most clicks. If clarity was the main factor, why remove the shading? It also highlights the propensity for web users to miss what might seem obvious to those designing and working on websites. The fact that 27% of those in the study when questioned did not realise that Google were doing any form of advertising in their results, further supports this, as well as being jaw-droppingly surprising in its own right. Pay-per-click is a very effective way of advertising your brand and reaching your target audience. It looks like about a third of people unknowingly click on ads and assume that ‘this is the best match’. For the rest of those ‘in the know’ then the ads and the brands that pay for them still receive prominence, but the user can make an informed choice about whether to click a promoted link or not, depending on the context of the search. Also, web designers and others ‘in the know’ should be wary of assuming ‘common’ knowledge on behalf of our customers. As our hundreds of user tests over the last decade have shown, it is very difficult to predict what customers’ knowledge or understanding is. When you do the tests, you are often humbled and surprised with how far off your assumptions are. We conducted a follow up survey on this subject, asking 2,000 people whether they were aware of ads on Google. What is Schema markup and why should you be using it? Pages with Schema markup rank four positions higher in search results, according to a study by Searchmetrics. That’s an incredibly juicy proposition. As I am a relative newcomer to the digital marketing world, this is like a trial-by-fire. In previous weeks I’ve covered terms like CRM, CRO and black hat and white hat SEO. This article will be a beginner’s guide covering various aspects of Schema, from a basic explanation as to what it means, to why you should be using and some stats to back up the claims.